Unleash the power of DSP to tune your system like never before! Armed with a 24-bit digital signal processor, our TwK™ System Tuning DSPs deliver exceptional system tuning functionality and flexibility. 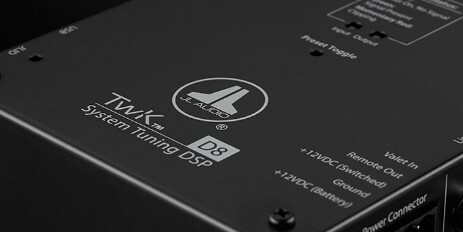 Both TwK™ models feature eight channels of crystal-clear audio outputs. An unprocessed, optical (Toslink) digital output is also included, so you can expand a system with additional TwK™ DSPs. The included DRC-200 Digital Remote Controller adds additional control and status reporting capabilities from the driver’s seat. Whether you’re an audio beginner, passionate enthusiast or audiophile, TwK™ DSPs are built to put the power of system tuning in your hands! Factory (OEM) head-units have evolved into fully integrated entertainment hubs, typically interconnected with supplementary vehicle controls, safety system displays and other critical vehicle functions. The days of “replacing the radio” are long-gone, and instead, we are required to work with the vehicle’s source unit. We saw this trend emerging over a decade ago, and we introduced the world’s first auto-correcting DSP OEM interface, the Cleansweep CL441dsp in 2004, establishing a new product category. Since then, our commitment to creating advanced OEM integration products has only intensified. 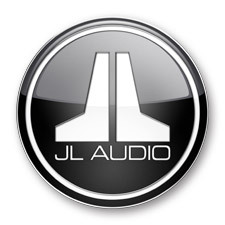 Today’s JL Audio FiX™ line of OEM Integration DSPs is incredibly advanced, and fully armed to deal with the challenges presented by today’s factory audio systems. 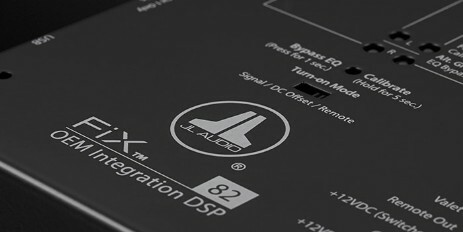 FiX™ DSPs are purpose-engineered to connect to complex factory audio systems, without interfering with vehicle functionality, safety or reliability. Equipped with a powerful 24-bit DSP, with proprietary programming and correction algorithms. FiX™ combines the functions of a powerful audio analyzer, line output converter, digital delay, signal-summing preamplifier and multiple 30-band equalizers. These functional blocks are programmed to measure multiple factory audio signals, level match them, correct any delay, sum them, and then equalize them for flat response. All of this happens automatically, with the press of a button. The results are clean, flat audio signals you can build your dream system around.